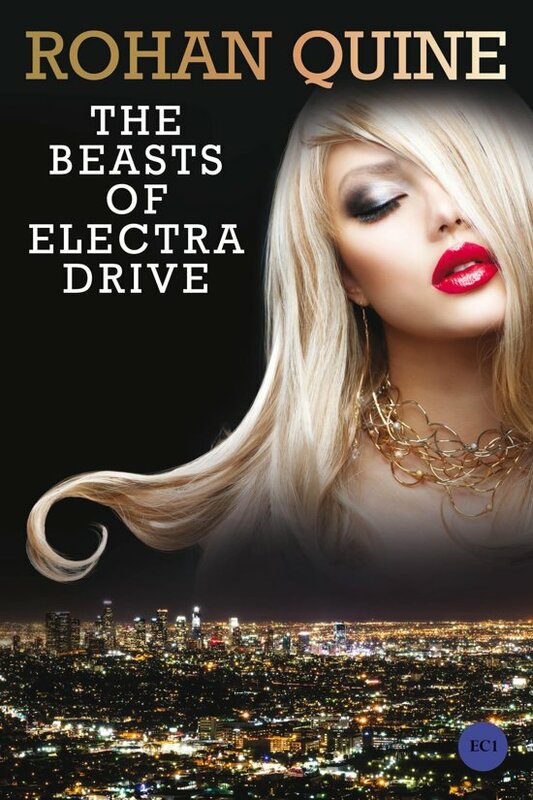 From Hollywood Hills mansions and Century City towers, to South Central motels and the oceanside refinery, ''The Beasts of Electra Drive'' by Rohan Quine spans a mythic L.A., following seven spectacular characters (or Beasts) from games designer Jaymi's game-worlds. The intensity of those Beasts' creation cycles leads to their release into real life in seemingly human forms, and to their combative protection of him from destructive rivals at mainstream company Bang Dead Games. Grand spaces of beauty interlock with narrow rooms of terror, both in the real world and in the incorporeal world of cyberspace. A prequel to Quine's existing five tales, ''The Beasts of Electra Drive'' is a unique explosion of glamour and beauty, horror and enchantment, exploring the mechanisms and magic of creativity itself. Bang Dead is preparing the global release of a game called ''Ain'tTheyFreaky! '', centring on five tabloid-flavoured social-media "Newsfeeds" for the victimisation of certain people by others—the "Gal Score", "Guy Score", "Trivia Score", "Arts Score" and "Cosy Score". Jaymi decides to fight back, for self-protection and to counteract this game's destructive effects. He takes an irrevocable step: after creating Amber, the most dangerous of the characters (or Beasts, as he calls them) who will populate Jaymi's project ''The Platinum Raven'', he releases Amber from that game, such that Amber slithers out from Jaymi's computer monitor. Appearing human, this now-incarnated Beast is sent to stalk ''Ain'tTheyFreaky! 's'' creators in real life—developer Dud, visual designer Kelly, IT boss Ashley and coder Herb. While Amber terrorises them, Jaymi creates a second Beast, Evelyn, a woman of ease and freedom, from his project ''The Imagination Thief''. Incarnated too, she joins Amber in sabotaging a Bang Dead venture in the physical world. As Jaymi's output spawns three more titles—''The Host in the Attic'', ''Apricot Eyes'' and ''Hallucination in Hong Kong''—he jumps into the creation cycles and subsequent incarnations of five more varied and human-seeming Beasts. These are Shigem, Kim, the Platinum Raven, Scorpio, and his own simulacrum the Jaymi Beast. After surviving a gun drone attack, he decides his Beasts' missions must escalate: they will infiltrate the substance of ''Ain'tTheyFreaky!''. Evelyn, Shigem and Kim therefore sneak into one of its visual environments (a mythically seedy Downtown L.A.), where they target the game's casually-programmed cruelty in tempting players to wreck the lives of the street queens of Violet Street. Shigem shames Herb into secretly working for Jaymi instead; and Kim persuades Ashley to join Jaymi likewise. Then five Beasts collaborate to sabotage ''Ain'tTheyFreaky!'' at code level. Turning its own server farm into a fabulous nightclub, they break the game down into its constituent glyphs and pixels, and send these up the cyber-pipes into the neighbouring refinery. Kelly's unrepentantness prompts Jaymi to send Amber to kill her. Amber is arrested, but escapes. Amber, Scorpio and the Jaymi Beast kidnap Dud, then tie him to the transmitter mast above the Hollywood Sign. Those same raw glyphs and pixels are refined into something of creative enchantment, when the tied-up Dud is forced to watch them billow from the refinery's smoke-stacks into a visionary "screening"—all re-programmed to constitute the substance of Jaymi's games instead. The Jaymi Beast himself then kills Dud on the mast. As Jaymi Peek sends his Beasts back through the monitor to be permanently sealed into his games, he feels re-integrated. He also knows he has sabotaged something globally destructive, while creating riches that will unfurl in those five titles.